The original painting by Francis Barraud is of Nipper, a dog he inherited from his brother Mark. 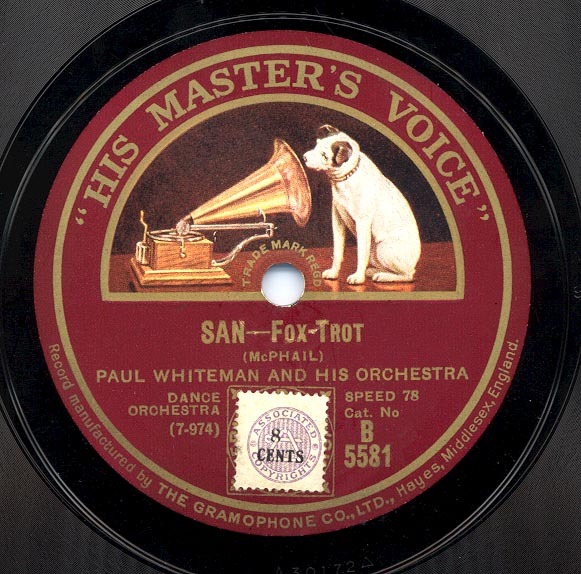 Living in Liverpool with Nipper, Barraud apparently caught him listening to his phonograph and “noticed how puzzled he was to make out where the voice came from.” Three years after Nipper's death in 1898, Barraud completed the painting, titling it “Dog looking at and listening to a Phonograph,” but soon gave it the now familiar name. At first Barraud had little luck selling the image, failing to have it included in a show at the Royal Academy or sell it to the illustrated press. The Edison Bell Company reportedly turned down the image, stating: “Dogs don't listen to phonographs.” Finally, after changing the make of phonograph to suit, Barraud sold the image and the copyright to the Gramophone Company of London for £100, a considerable amount of money for the time. The logo is currently owned by EMI Classics. 1. City Art Centre. 2001. Nipper and His Master's Voice. Music 100. City of Edinburgh Council. City Art Centre,. Accessed Oct 21 2002 from http:// www.ebs.hw.ac.uk/EDC/ CAC/m100/ nipper.html. This turn of phrase is still used today. In a July 25, 2000 New York Times news article, reporter Warren Hoge describes the role of Alastair Campbell, press spokesman for British Prime Minister Tony Blair, this way: “Campbell likes to call himself 'his master's voice,' but to the growing number of government critics, he is a master 'spin doctor. '...” Here we see not only the evocation of the dog listening to the phonograph, but also a turnabout in which the dog becomes the disc jockey, spinning the wax. 3. Hoge, Warren. 2000. Blair's Close Political Confidant Spins into a Spotlight. New York Times, Jul 25, 4. The image and phrase were taken up for political satire almost immediately. In 1908 they were used to mock the Democratic Party and its continued enthrallment with President William Jennings Bryan even after he was defeated in his attempt for a second term by William McKinley in 1896. He unsuccessfully ran again in 1900 and 1908. In Figure 3 we see the Democratic donkey (representing rank-and-file party members) taking the place of Nipper. Bryan is cast in the role of the phonograph while other Democratic presidential hopefuls look on helplessly. About the illustrations: Figure 1 shows one of the original paintings. This image is in the public domain in the United States. This applies to U.S. works where the copyright has expired because its first publication occurred prior to January 1, 1923. Figure 2 illustrates how the original painting was translated into a corporate logo, shown here on a record label. This image is in the public domain in the United States. Figure 3 is a political cartoon by Clifford K. Berryman, published on March 13, 1908; it most likely appeared in the Evening Star. The image appears here courtesy of the National Archives. It is in the public domain because the copyright has expired.